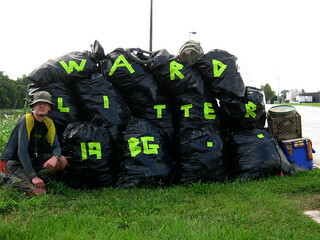 As I was planning this as a solo cleanup, I decided that I’d choose a spot that would have very high litter density. 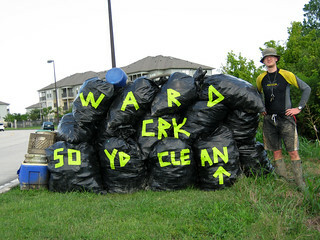 During the Ward Creek recon run in January, I noted that there were spots on the flat bank where water apparently ran back into the creek itself, and in some spots there were strainer trees that collected large quantities of litter in one area. I figured I’d put my canoe in at East Harbor and paddle down to the first litter collector I found. I didn’t even have to go a quarter mile downstream from East Harbor to find my spot. There was a nice semi-downed tree marking it, and the bank was just low enough for me to slide ashore. Once I was on solid (er, semi-solid?) ground, I discovered how very right my choice was. An area a few paces wide and about fifty yards long was completely *covered* in litter. Bottles, cans, containers, balls,… it had it all. 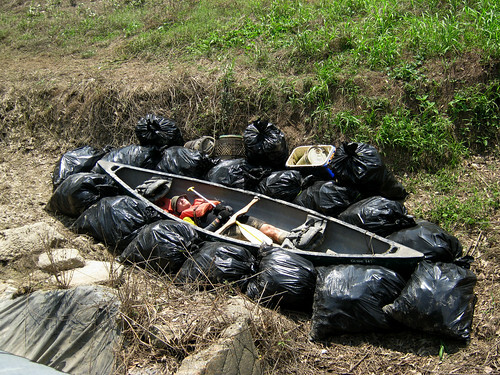 After an hour and a quarter of picking litter, I wanted a break, so I loaded the five of the first 55-gallon contractor bags into the canoe. (I knew I could load seven at once, but then I can’t see where I’m going, so I settled for five at a time.) I took my time paddling them back to East Harbor and having some more gatorade as I rested my poor body. Apparently picking litter uses *muscles* and *joints* and such. Go figure, eh?